My good friend Kelly came up with an idea for a new series for 2019 and invited Barb and I to participate with her. She calls the series One Plus Twelve because we each chose ONE - only one - stamp to use each month for twelve months. Per instructions, we cannot use any other stamped image with this series, only the one. We can use a sentiment if we choose to, but that is optional and can change each month. 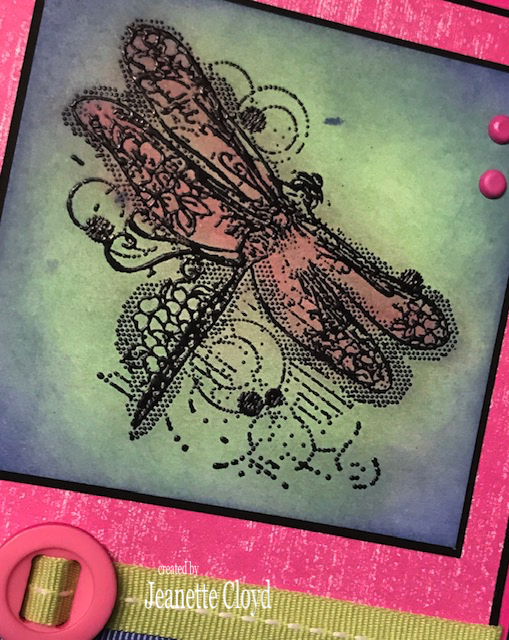 The idea is that we will try different techniques and such with the stamp we choose. We post our creations on the third of each month, so this is my second post. 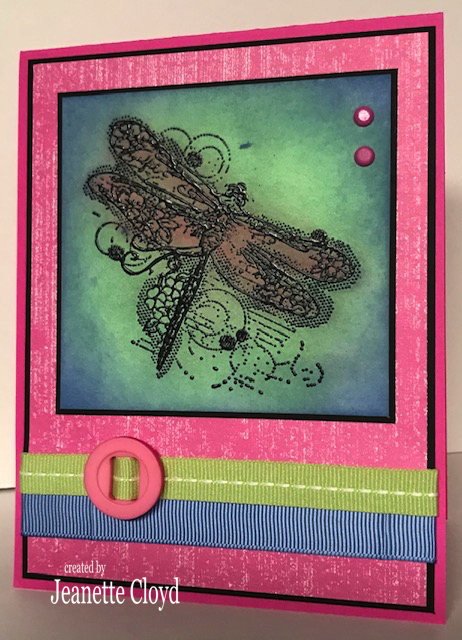 The stamp I've chosen to use for this series is the dragonfly from Unity's Be the Best stamp set. You can see my January One Plus Twelve card HERE. 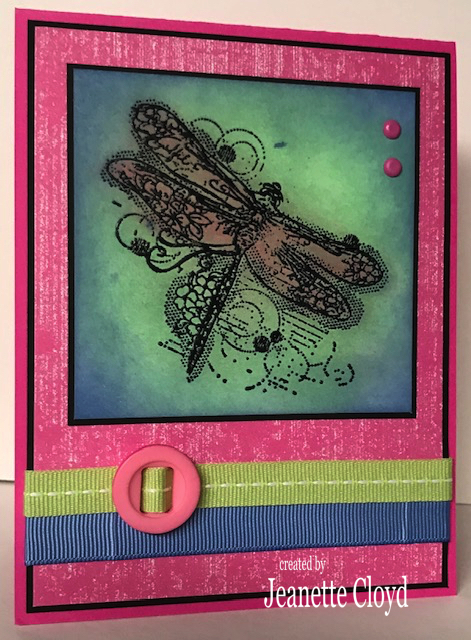 I started easy - I stamped the image, colored it minimally (with a gel pen), and made a card. This month I tried something different. 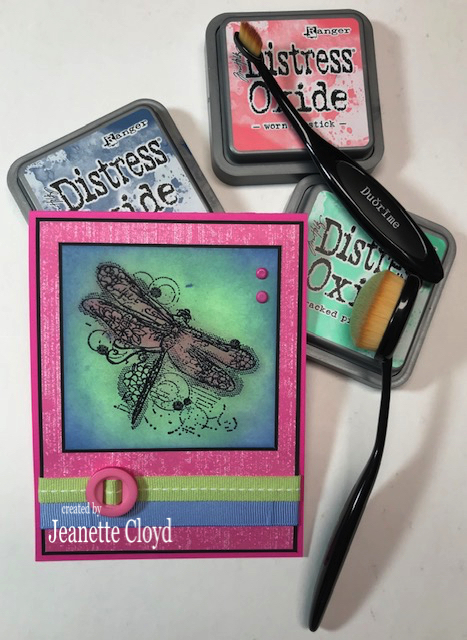 I stamped the image with Versafine ink and heat embossed it with SU Black Embossing powder. Then I applied three colors of Ranger Distress Oxide inks to the image. Once I'd attained a look I was satisfied with, I took a paper towel and buffed the embossed part to remove any ink and give the black its shine. I used my brand new makeup applicators to apply the Cracked Pistachio and Worn Lipstick ink to the image. They gave me the needed control to get the ink where I wanted it without rigid lines/marks. I'd heard such outstanding praise of these applicators and I must say, I was quite impressed with how they achieved the look I wanted. I used a basic sponge applicator to add the Faded Jeans ink around the edges. I noticed (too late) that my overall card design is VERY similar for January and February. I hate when I do that! UGH!!! I am going to do my very best to shake that up in March, so be sure to come back on March 3rd to see how I do with that. Now, let's head over to head over to Kelly's blog and Barb's blog to check out their One Plus Twelve creations. This sure is a pretty card. I love the colors you picked! This will be a fun challenge and I am excited to be on this journey with my friends! Wonderful second card for the One Plus Twelve - my 3 am creativity madness! :) I love the fresh spring-y colors - great accent to the lovely dragonfly! So very beautiful, Jeanette!! This brushes are my absolute favorites, as well! !